The mother of all vertically-scrolling shoot-em-ups! In River Raid, you control a fighter jet flying at low altitude over a river, shooting tanker ships, helicopters, and other planes while keeping a close eye on your fuel level. Not only can your plane move from side to side, but you can also speed up and slow down by pushing the joystick forward and back. Speeding up causes your plane to expend fuel at a faster rate, but is often necessary to avoid danger. The river is littered with fuel depots that will refuel your plane when flown over, but they can also be shot, and their point value is higher than both the tankers and the helicopters. The best strategy is to fly over the depot to refuel, and then shoot it at the last minute so that you get the fuel and the points. You can be killed by running into enemy vehicles, running into the the sides of the river or islands, and by running out of fuel. Although the game loops ad infinitum (actually it stops when you hit 1 million points), it takes quite a while before the terrain loops back around to the beginning. Sections of the river are separated by bridges that must be destroyed, and at which you re-start the game when killed. The Activision high score patch for River Raid could be obtained with a score of 15,000 or more, which can be accomplished in the first sitting by any seasoned video game player. It was games like this by companies like Activision and Imagic that really made Atari’s first-party titles look primitive in comparison. River Raid has detailed graphics, colorful scenery, smooth animation, spot-on controls, and the sound effects are a far cry from the beeps and blips of games like pong and breakout. 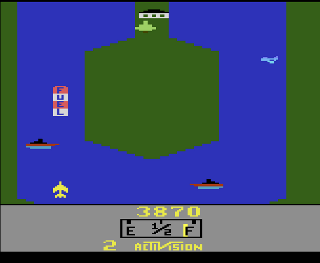 River Raid is easily one of the best games on the Atari 2600. Buy River Raid on GameGavel or Amazon. Tagged 2600, Arcade, Atari, Review, River Raid, Shooter, VCS. Bookmark the permalink.